This article discusses the indications for selective amygdalohippocampectomy (SAH) and the surgical techniques used to perform it. Surgery is most often considered and most frequently successful in patients with temporal lobe epilepsy (TLE). Most patients with TLE have seizures that originate from the mesial-basal temporal lobe structures (hippocampus, amygdala, parahippocampal gyrus). Traditionally, the standard surgical treatment has been an en bloc anterior temporal lobectomy (ATL). The primary advantages of ATL are the relatively low morbidity and the good surgical exposure that allows complete resection of mesial structures; this procedure also permits pathologic examination of en bloc specimens. ATL is still commonly used today. Data from animal models and from pathologic, electrophysiologic, and structural and functional imaging studies support the contention that most temporal lobe epilepsy arises from mesial temporal structures. This suggests the possibility that more targeted mesial temporal resections that spare temporal neocortex (eg, SAH) might provide equally good seizure control and result in fewer neuropsychological sequelae than ATL (see the image below). Comparison of anterior temporal lobectomy and selective amygdalohippocampectomy. Presuming near equivalence in seizure-free outcomes, SAH would be preferred over ATL if it could be clearly demonstrated that the more selective procedure would result in superior postoperative neuropsychological outcomes. Here, the results have been mixed. Although many studies suggest that SAH can spare some aspects of cognitive function as compared with ATL, [5, 18, 10, 19, 20, 21, 22, 23, 11, 24] others have reported mixed findings and have not shown the more selective procedure to provide a clear benefit. [25, 26, 27, 28] SAH can still cause significant verbal memory impairment in some cases of dominant temporal lobe resection, and it does not eliminate the need for careful preoperative evaluation (including assessment of risk to memory function). The cerebrum is the largest component of the brain. It is divided into right and left hemispheres. The corpus callosum is the collection of white matter fibers that joins these hemispheres. Each of the cerebral hemispheres is further divided into 4 lobes: the frontal lobe, the parietal lobe, the temporal lobe, and the occipital lobe. The medial temporal lobe structures are considered by some to be part of the so-called limbic lobe. The limbic system is a grouping of cortical and subcortical structures involved in memory formation and emotional responses. The limbic system allows for complex interactions between the cortex, the thalamus, the hypothalamus, and the brainstem. The limbic system is not defined by strict anatomic boundaries but incorporates several important structures. The limbic structures conventionally include the amygdala, the hippocampus, the fornix, the mammillary bodies, the cingulate gyrus, and the parahippocampal gyrus. For more information about the relevant anatomy, see Brain Anatomy. Particularly in nonlesional cases, if standard evaluation, supplemented by specialized imaging studies, defines a unilateral temporal lobe onset, intracranial EEG monitoring may be required for distinguishing mesial from temporal neocortical onset so as to determine whether SAH is indicated. Careful attention to surgical technique will lead to better technical results and reduced complication rate. Navigate from "safe zone" to "safe zone"
Intraoperative complications can be minimized by strict adherence to timeout procedures, careful patient positioning, and careful visual identification of landmarks coupled with repeated reconfirmation of stereotactic findings. Attention to careful patient selection and preoperative testing can minimize the risk to memory and the chances of mood disturbances and can maximize efficacy by excluding inappropriate patients. Routine general anesthesia with endotracheal intubation is indicated. Antibiotics are administered. To minimize intraoperative brain shift, mannitol is avoided. The patient is placed in the supine position, with the head rotated 90º to the opposite side and parallel to the floor. The head is held in position in a 3-pin fixateur. Various approaches to selective amygdalohippocampectomy (SAH) have been developed. Of these, the transcortical approach will be described in some detail (see the video below). Additional comments will be made about alternative approaches (eg, transsylvian and subtemporal). Scalp fiducials are registered, and the planned entry point is marked on the scalp, along with planned bone flap and scalp incisions. The scalp is prepared, draped, and infiltrated with lidocaine 1%, bupivacaine 0.25%, and epinephrine. A linear scalp incision is performed. The temporalis fascia is incised, separated from the periosteum, and retracted laterally. A neuronavigation system is used to determine the location of the temporal craniotomy. The dura is opened and flapped inferiorly. The neuronavigation system is used to estimate the distance from the temporal pole and then to plan an entry point in the middle temporal gyrus in a section that is free of cortical vessels. The entry point should be no greater than 3.5 cm from temporal pole (dominant temporal lobe). 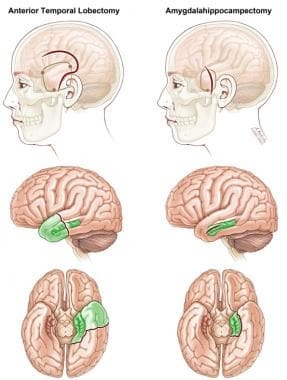 A 1.5-2 cm cortical incision is planned. 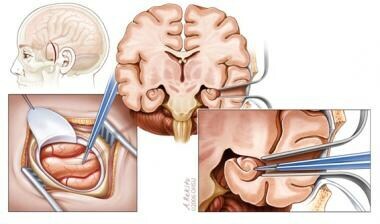 The cortical surface is opened with a bipolar cautery (see the image below). Guided by neuronavigation, dissection is performed toward the temporal pole. When the temporal horn is entered, 2 self-retaining brain retractors are set up to optimize the view of the intraventricular anatomy (see the image below). Resection of the parahippocampal gyrus is performed, beginning with subpial resection of the uncus and then proceeding medially and posteriorly. Neuronavigational confirmation is frequently obtained at this stage. To avoid injuring the posterior cerebral artery, third cranial nerve, or cerebral peduncle, the mesial pial border must be strictly preserved. After parahippocampal gyrus resection, the hippocampus is mobilized laterally into the resection cavity. Hippocampal resection proceeds from anterior to posterior, with care taken to identify and preserve the anterior choroidal artery. The resection is extended posteriorly to the level of the tectal plate on axial navigation magnetic resonance imaging (MRI). Neuronavigation is used to confirm the completeness of the resection. The resection cavity is inspected, and hemostasis is achieved. Brain retractors are removed, and the dura is closed. The bone flap is plated. The temporalis muscle is reapproximated, and the scalp is closed in layers to the skin with reabsorbable sutures. After completion of anesthesia, a neurologic examination is performed. A postoperative computed tomography (CT) scan of the head is obtained. Antiepileptic medications are continued. The patient is monitored overnight in a neurological intensive care unit (ICU). The postoperative hospital stay is generally 3-4 days. Wiebe S, Blume WT, Girvin JP, Eliasziw M,. A randomized, controlled trial of surgery for temporal-lobe epilepsy. N Engl J Med. 2001 Aug 2. 345(5):311-8. [Medline]. Spencer DD, Spencer SS, Mattson RH, Williamson PD, Novelly RA. Access to the posterior medial temporal lobe structures in the surgical treatment of temporal lobe epilepsy. Neurosurgery. 1984 Nov. 15(5):667-71. [Medline]. Spencer DDIJ. Temporal Lobectomy. H Luders, Ed. Epilepsy Surgery. New York, NY: Raven Press; 1991. 533-45. Niemeyer P. The transventricular amygdala-hippocampectomy in temporal lobe epilepsy. Baldwin M, Bailey P (Eds). Temporal Lobe Epilepsy. Springfield, IL: Charles C Thomas; 1958. 461-82. Wieser HG, Yasargil MG. Selective amygdalohippocampectomy as a surgical treatment of mesiobasal limbic epilepsy. Surg Neurol. 1982 Jun. 17(6):445-57. [Medline]. Yasargil MG, Wieser HG, Valavanis A, von Ammon K, Roth P. Surgery and results of selective amygdala-hippocampectomy in one hundred patients with nonlesional limbic epilepsy. Neurosurg Clin N Am. 1993 Apr. 4(2):243-61. [Medline]. Park TS, Bourgeois BF, Silbergeld DL, Dodson WE. Subtemporal transparahippocampal amygdalohippocampectomy for surgical treatment of mesial temporal lobe epilepsy. Technical note. J Neurosurg. 1996 Dec. 85(6):1172-6. [Medline]. Little AS, Smith KA, Kirlin K, Baxter LC, Chung S, Maganti R. Modifications to the subtemporal selective amygdalohippocampectomy using a minimal-access technique: seizure and neuropsychological outcomes. J Neurosurg. 2009 Dec. 111(6):1263-74. [Medline]. Arruda F, Cendes F, Andermann F, Dubeau F, Villemure JG, Jones-Gotman M. Mesial atrophy and outcome after amygdalohippocampectomy or temporal lobe removal. Ann Neurol. 1996 Sep. 40(3):446-50. [Medline]. Clusmann H, Schramm J, Kral T, Helmstaedter C, Ostertun B, Fimmers R. Prognostic factors and outcome after different types of resection for temporal lobe epilepsy. J Neurosurg. 2002 Nov. 97(5):1131-41. [Medline]. Paglioli E, Palmini A, Portuguez M, Paglioli E, Azambuja N, da Costa JC. Seizure and memory outcome following temporal lobe surgery: selective compared with nonselective approaches for hippocampal sclerosis. J Neurosurg. 2006 Jan. 104(1):70-8. [Medline]. Acar G, Acar F, Miller J, Spencer DC, Burchiel KJ. Seizure outcome following transcortical selective amygdalohippocampectomy in mesial temporal lobe epilepsy. Stereotact Funct Neurosurg. 2008. 86(5):314-9. [Medline]. Tanriverdi T, Olivier A, Poulin N, Andermann F, Dubeau F. Long-term seizure outcome after mesial temporal lobe epilepsy surgery: corticalamygdalohippocampectomy versus selective amygdalohippocampectomy. J Neurosurg. 2008 Mar. 108(3):517-24. [Medline]. Schramm J, Lehmann TN, Zentner J, et al. Randomized controlled trial of 2.5-cm versus 3.5-cm mesial temporal resection-part 2: volumetric resection extent and subgroup analyses. Acta Neurochir (Wien). 2011 Feb. 153(2):221-8. [Medline]. Josephson CB, Dykeman J, Fiest KM, Liu X, Sadler RM, Jette N. Systematic review and meta-analysis of standard vs selective temporal lobe epilepsy surgery. Neurology. 2013 Apr 30. 80(18):1669-76. [Medline]. Mathern GW, Miller JW. Outcomes for temporal lobe epilepsy operations may not be equal: a call for an RCT of ATL vs SAH. Neurology. 2013 Apr 30. 80(18):1630-1. [Medline]. Nascimento FA, Gatto LA, Silvado C, Mäder-Joaquim MJ, Moro MS, Araujo JC. Anterior temporal lobectomy versus selective amygdalohippocampectomy in patients with mesial temporal lobe epilepsy. Arq Neuropsiquiatr. 2016 Jan. 74 (1):35-43. [Medline]. [Full Text]. Pauli E, Pickel S, Schulemann H, Buchfelder M, Stefan H. Neuropsychologic findings depending on the type of the resection in temporal lobe epilepsy. Adv Neurol. 1999. 81:371-7. [Medline]. Gleissner U, Helmstaedter C, Schramm J, Elger CE. Memory outcome after selective amygdalohippocampectomy: a study in 140 patients with temporal lobe epilepsy. Epilepsia. 2002 Jan. 43(1):87-95. [Medline]. Helmstaedter C, Reuber M, Elger CC. Interaction of cognitive aging and memory deficits related to epilepsy surgery. Ann Neurol. 2002 Jul. 52(1):89-94. [Medline]. Hori T, Yamane F, Ochiai T, Hayashi M, Taira T. Subtemporal amygdalohippocampectomy prevents verbal memory impairment in the language-dominant hemisphere. Stereotact Funct Neurosurg. 2003. 80(1-4):18-21. [Medline]. Gleissner U, Helmstaedter C, Schramm J, Elger CE. Memory outcome after selective amygdalohippocampectomy in patients with temporal lobe epilepsy: one-year follow-up. Epilepsia. 2004 Aug. 45(8):960-2. [Medline]. Morino M, Uda T, Naito K, Yoshimura M, Ishibashi K, Goto T. Comparison of neuropsychological outcomes after selective amygdalohippocampectomy versus anterior temporal lobectomy. Epilepsy Behav. 2006 Aug. 9(1):95-100. [Medline]. Hori T, Yamane F, Ochiai T, Kondo S, Shimizu S, Ishii K. Selective subtemporal amygdalohippocampectomy for refractory temporal lobe epilepsy: operative and neuropsychological outcomes. J Neurosurg. 2007 Jan. 106(1):134-41. [Medline]. Goldstein LH, Polkey CE. Short-term cognitive changes after unilateral temporal lobectomy or unilateral amygdalo-hippocampectomy for the relief of temporal lobe epilepsy. J Neurol Neurosurg Psychiatry. 1993 Feb. 56(2):135-40. [Medline]. Wolf RL, Ivnik RJ, Hirschorn KA, Sharbrough FW, Cascino GD, Marsh WR. Neurocognitive efficiency following left temporal lobectomy: standard versus limited resection. J Neurosurg. 1993 Jul. 79(1):76-83. [Medline]. Jones-Gotman M, Zatorre RJ, Olivier A, Andermann F, Cendes F, Staunton H. Learning and retention of words and designs following excision from medial or lateral temporal-lobe structures. Neuropsychologia. 1997 Jul. 35(7):963-73. [Medline]. Tanriverdi T, Dudley RW, Hasan A, Jishi AA, Hinai QA, Poulin N. Memory outcome after temporal lobe epilepsy surgery: corticoamygdalohippocampectomy versus selective amygdalohippocampectomy. J Neurosurg. 2010 Dec. 113(6):1164-1175. [Medline]. Tanriverdi T, Dudley RW, Hasan A, et al. Memory outcome after temporal lobe epilepsy surgery: corticoamygdalohippocampectomy versus selective amygdalohippocampectomy. J Neurosurg. 2010 Dec. 113(6):1164-75. [Medline]. Hoyt AT, Smith KA. Selective Amygdalohippocampectomy. Neurosurg Clin N Am. 2016 Jan. 27 (1):1-17. [Medline]. Yasargil MG, Krayenbühl N, Roth P, Hsu SP, Yasargil DC. The selective amygdalohippocampectomy for intractable temporal limbic seizures. J Neurosurg. 2010 Jan. 112(1):168-85. [Medline]. Schmeiser B, Wagner K, Schulze-Bonhage A, Elger CE, Steinhoff BJ, Wendling AS, et al. Transsylvian Selective Amygdalohippocampectomy for Mesiotemporal Epilepsy: Experience with 162 Procedures. Neurosurgery. 2017 Mar 1. 80 (3):454-464. [Medline]. Schaller C, Jung A, Clusmann H, Schramm J, Meyer B. Rate of vasospasm following the transsylvian versus transcortical approach for selective amygdalohippocampectomy. Neurol Res. 2004 Sep. 26(6):666-70. [Medline]. Takaya S, Mikuni N, Mitsueda T, Satow T, Taki J, Kinoshita M. Improved cerebral function in mesial temporal lobe epilepsy after subtemporal amygdalohippocampectomy. Brain. 2009 Jan. 132(Pt 1):185-94. [Medline]. The authors wish to thank Andy Rekito for permission to use his artwork for the figures and multimedia portions of the article.